Universal Studios is the oldest movie studio in continuous production in the United Sttates, and the fourth oldest in the world. 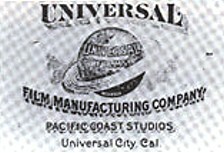 The studio was founded by Charles Baumann, Jules Brulatour, Mark Dintenfass, David Horsley, Adam Kessel, Carl Laemmle, Pat Powers, and William Swanson in 1912 as Universal Film and Manufacturing Company. The studio is currently owned by Comcast as a division of NBCUniversal, with production facilities in Universal City, California and corporate offices in New York City. Carl Laemmle began in Chicago in 1908 as a nickelodeon exhibitor. He and other exhibitors felt the Edison Trust was taking too much of their profits in enforcing its monopoly, and they began a production company in Fort Lee, New Jersey called Independent Moving Pictures Company (IMP). The IMP was unusual in that they billed the performers in their films, the first such company to do so. By 1912, Laemmle brought seven other like-minded producers together to form The Universal Film and Manufacturing Company. The company moved it's base of operations to California to escape the long arm of the Edison Trust. They built the largest studio of their time, just over the Cahunga Pass from Hollywood, and named it Universal City. 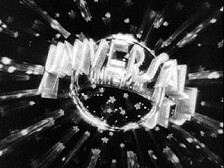 Universal was one of the first studios to have a full-fledged animation division. Through Laemmle partner Pat Powers, animated series such as Fuller Pep and Toyland were produced in house. Other series like The Whozit Weekly and Cinema Luke were also produced in house for newsreel purposes. Oswald, even under Lantz, proved very popular, and continued into 1930. Universal president Carl Laemmle became dissatisfied with the Mintz-Winkler product and fired them, deciding instead to bring Oswald directly on the Universal lot. The Laemmle/Lantz partnership proved fruitful, and lasted over thirty years. In September of 1929, Lantz delivered Race Riot, an Oswald cartoon and the first cartoon he produced for Universal. by 1935, Lantz began his own studio, with the backing of Universal. He continued to supply Universal with theatrical cartoons and series through 1972. 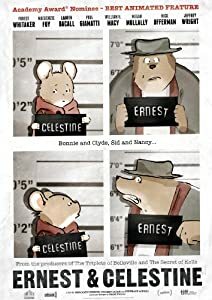 Through the thirties, Lantz struggled to find a cartoon character with the legs of Oswald or Mickey. He tried a lot of characters, like Meany, Miny and Moe and Pooch the Pup, but none seemed to really catch the public's attention. Lantz' break came in 1940, immediately following his marriage to actress Grace Stafford. During their honeymoon, the couple kept hearing a woodpecker incessantly pecking on their roof. Grace suggested that Walter use the bird for inspiration and make him into a cartoon character. Taking her advice, though a bit skeptical about its success, Lantz debuted Woody Woodpecker in an Andy Panda short, Knock Knock. The brash woodpecker character was similar to the early Daffy Duck, and Lantz liked the results enough to build a series around it. Mel Blanc supplied Woody's voice for his first three cartoons. When Blanc accepted a full-time contract with Leon Schlesinger Productions/Warner Bros. and left the Lantz studio, gag-man Ben Hardaway, who was the main force responsible for Knock Knock, became the bird's voice. Despite this, Blanc's distinctive laugh was still used throughout the cartoons. Blanc ended up suing Lantz. Despite winning the lawsuit, Lantz still paid Blanc a half-million dollars for the use of Blanc's voice as Woody. 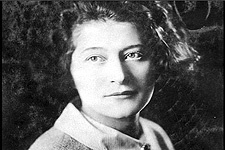 In 1950, Lantz held anonymous auditions. Grace, Lantz's wife, had offered to do Woody's voice; however, Lantz turned her down because Woody was a male character. Not discouraged in the least, Grace went about secretly making her own anonymous audition tape, and submitted it with the others for the studio to listen to. Not knowing whose voice was being heard, Lantz picked Grace's voice to do Woody Woodpecker. Grace supplied Woody's voice until the end of production in 1972, and also appeared in other non-Woody cartoons. At first, Grace voiced Woody without screen credit, because she thought that it would disappoint the children to know Woody Woodpecker was voiced by a woman. However, she soon came to enjoy being known as the voice of Woody Woodpecker, and allowed her name to be credited on the screen. Her version of Woody was cuter and friendlier than the manic Woody of the 1940s, and Lantz's artists redesigned the character to suit the new voice personality. Lantz's harmonious relationship with Universal, the studio releasing his cartoons, was interrupted when new ownership transformed the company into Universal-International and did away with most of Universal's company policies. The new management insisted on getting licensing and merchandising rights to Lantz's characters. Lantz refused and withdrew from the parent company by the end of 1947, releasing 12 cartoons independently through United Artists during 1948, into the beginning of 1949. Financial difficulties forced Lantz to shut down his studio in 1949. Universal-International re-released Lantz's UA (and several of his earlier) cartoons during the shutdown and finally came to terms with Lantz, who resumed production in 1951. From this point forward Lantz worked quicker and cheaper, no longer using the lush, artistic backgrounds and stylings that distinguished his 1940s work. By 1960, Lantz had moved into producing cartoons for television. Lantz used his TV appearances on The Woody Woodpecker Show (which began its run in 1957) to demonstrate the animation process. Into the sixties, all but two major studios closed down their theatrical animation departments; Lantz and DePatie-Freleng being the only hold outs. But the writing was on the walls, and by 1972, Walter Lantz closed his studio. 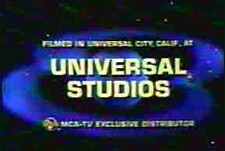 Universal became the home base for other studios that produced animated films though the eighties. Notable was Steven Speilberg's Amblin Entertainment which produced An American Tail, The Land Before Time and Who Framed Roger Rabbit. 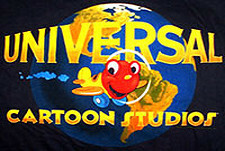 In 1991, Universal started their own TV animation production wing called Universal Cartoon Studios. Universal Studios is based in Universal City, California. 2.3/5 Stars from 8 users. 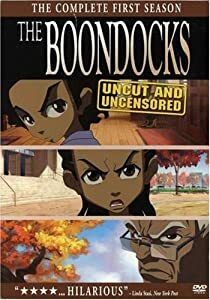 Please give the Cartoon Series Universal Studios a vote between 1 and five stars, with five stars being the best, 1 being a show you absolutely hate, and a three for an average show. This Studio has been viewed 3 times this month, and 113,720 times total. Universal Studios (Universal Pictures) Studio Directory -Alternate: Universal Pictures by Big Cartoon DataBase is licensed under a Creative Commons Attribution-NonCommercial-ShareAlike 4.0 International License.